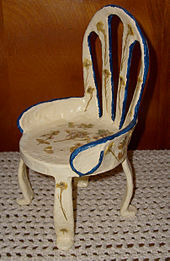 Pressed flower decoupage on a miniature chair. Pressed flower craft consists of drying flower petals and leaves in a flower press to flatten and exclude light and moisture. Pressing flowers makes them appear flat, and there is often a change in color, ranging from faded colors to a greater intensity of vibrant colors. It has long been practiced as an art form in China and in Japan, where it is known as oshibana (押し花). Outside of Asia, the art gained popularity in England during the Victorian era and has experienced a revival in the last 30 years or so. It is currently used in Australia and in the United States by some recognized artists, including Cellestine Hannemann and Janie Gross,. The pressed flowers and leaves can be used in a variety of craft projects. They are often mounted on special paper, such as handmade paper, Ingres paper, Japanese paper, or paper decorated by marbling. With meticulous attention to detail, each leaf and flower is glued onto a precise location. With a creative approach to the use of materials, a leaf becomes a tree and petals form mountains. Washes of watercolor painting are sometimes applied to the backing paper before the pressed material is attached. Pressed material may also be mounted on fabrics, such as velvet, silk, linen or cotton. Petals and leaves can be applied to wood furnishings using the technique of Decoupage. The Pressed Flower Craft Guild was established in 1983 by Joyce Fenton (a pressed flower artist) and Bill Edwardes (who devised the method of framing pressed flower pictures adopted by the Guild). It has members throughout the UK and in other parts of the world. To encourage members to improve their standard of work by a series of assessments to attain Bronze, Silver or Gold awards. In the case of overseas members, to obtain Grade I and Grade II Awards. Proficiency awards in a number of different specialities may be attained after the Gold Award is gained. The Overseas Advanced Award may be taken by overseas members who have gained the Grade I and Grade II awards. A different subject for both of these awards is announced annually. The IPFAS in an international pressed flower organization that promotes pressed flower art and offers education and holds competitions. It has members from over 20 nations (as of 2010) including Japan, the United Kingdom, United States, France, Germany, Mexico, and Australia. It was founded in 1999 by Nobuo Sugino, a Japanese pressed flower artist and President of Japan Wonderful Oshibana Club. The WWPFG was established in July 2001. In November 2008, the guild was incorporated in North Carolina, USA, as a public educational non-profit organisation. ^ Townsend, S. P. (1987). "Oshibana". Bulletin - Pacific Tropical Botanical Garden. 17 (1): 12–13. Retrieved 19 March 2015. ^ a b Phillymag (22 June 2007). "Home: Pressing On". Metrocorp. Philadelphia. Retrieved 20 March 2015. ^ Penny., Black, (1988). The book of pressed flowers. New York: Simon and Schuster. ISBN 0671660713. OCLC 16712180. ^ "The Pressed Flower Guild - Home". www.pressedflowerguild.org.uk. ^ "World Wide Pressed Flower Guild". www.wwpfg.com. Burkhart, W. Eugene, Jr. Pressed Flower Art: Tips, Tools, and Techniques for Learning the Craft. Mechanicsburg, PA: Stackpole Books, 2008. Oshibana, by Natalia Kishigami. 2013.